Nowadays there are a number of different services that you can use service lists with in order to give clients all the information they might need. 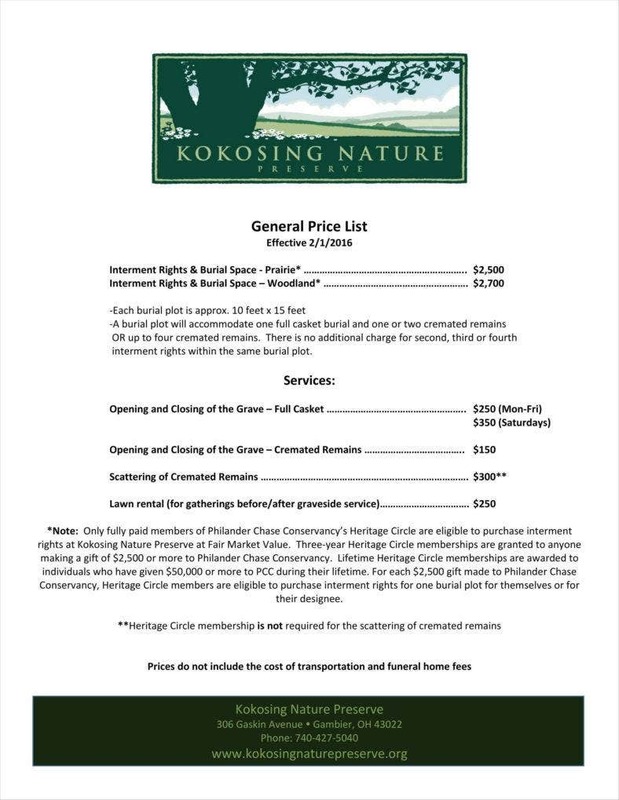 One of the more unusual examples is a general price list, which gives you all the different services offered by a given funeral home. This can be a fairly important tool for such businesses as many laymen may not be too familiar with the process until they need to be. Like other sample price menus that you can use for other businesses, there are some general price list templates available for you to use. These should be quite desirable tools, both for explaining exactly what you can offer to laymen and to advertise your own business to potential clients. You can even make the argument that funeral homes would have a particular need for these tools considering that your line of work is not exactly the most widespread for all that it is a necessary business. Similar to the example of other businesses, you should know that you can make use of aids like price list templates in order to present your own offerings to your client base. 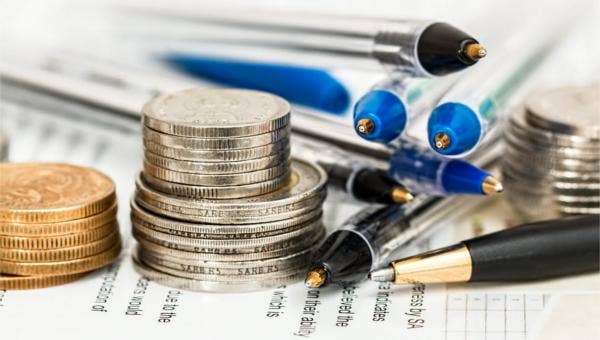 However, because of the unique nature of your line of work, there are some specific components of the general price lists you would have to make. Knowing what to include could contribute to your having an easier time of making your own lists, which would definitely be a boon during your writing process. 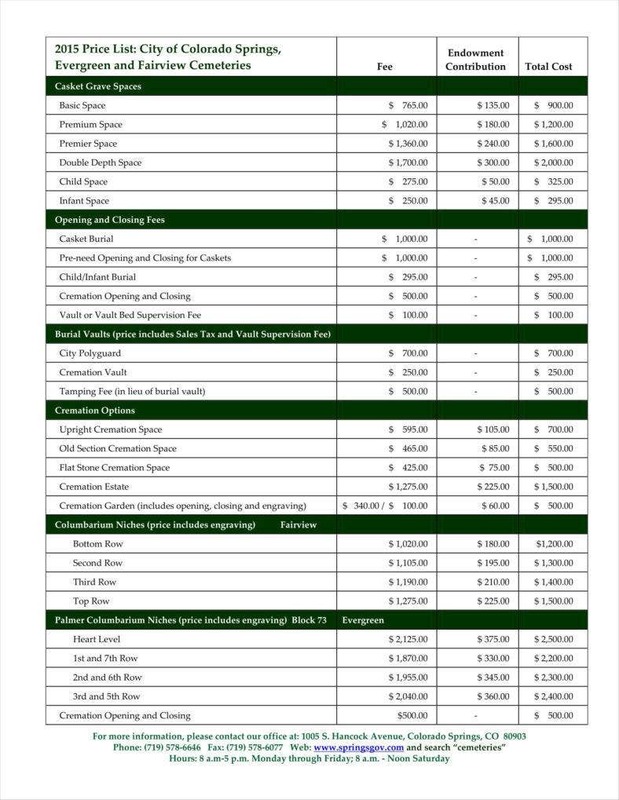 Like dedicated service businesses, your general price list should definitely make mention of the basic services you have to offer. Funeral-related services are a given, but it might help to include the general services you offer at your funeral home, such as planning the funeral service, meeting with family and clergy, coordinating with any third parties, filing the appropriate notices, and others. As with the case of other businesses that offer services to their clients, it always pays to use service price list templates in order for you to explain the basics of your services to make sure that your clients understand exactly what you have to offer. This is especially true of funeral homes as you should rightfully have quite a number of offerings for your clients. As a funeral home, embalming is an obvious service you can offer to your clients being that your business does involve preparation of bodies for the funeral and anything that comes before. However, laymen may not quite understand your business quite the way you do. This is why it would help to include embalming and the related costs so that your clients can decide if they do want to avail of embalming. After all, they may elect not to, for one reason or another such as to save on costs. Furthermore, since you would be including extra information on embalming, this allows you to give your clients more information that could help them make a more informed decision. For example, you could take the time to tell your clients that embalming is not required by law, which could do much to set your clients’ minds at ease. 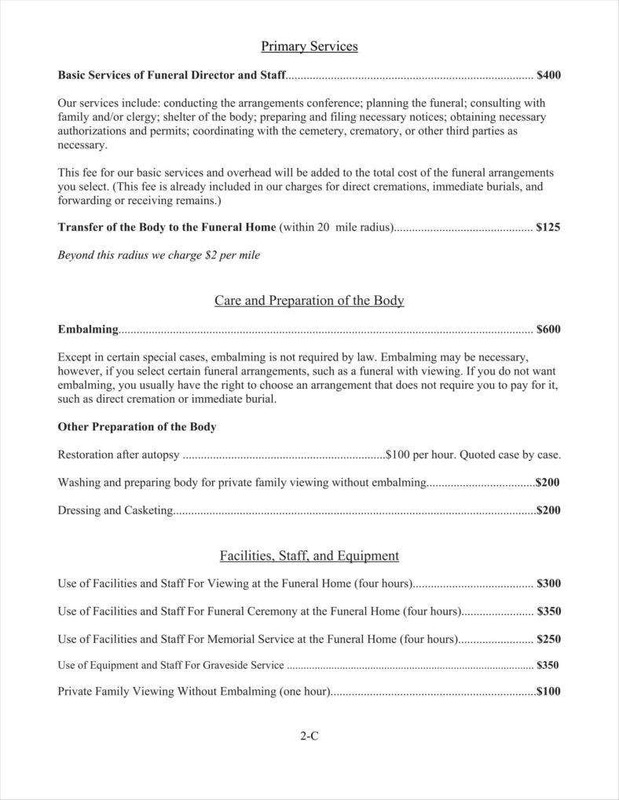 Aside from just embalming the remains of the deceased, you may also provide other related services on behalf of your clients. For example, you may have to engage in restoration work on the deceased, washing, dressing, and so on. 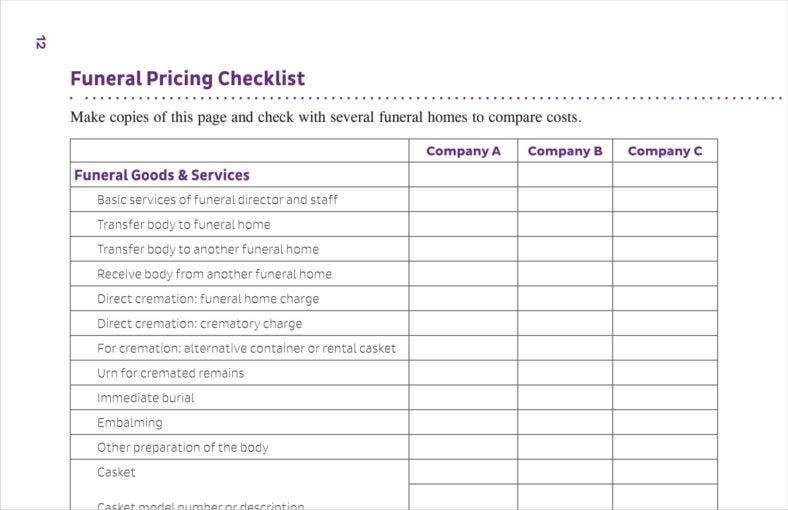 Including this information on your price lists can serve to provide more information for your clients so that they can tell exactly what they want regarding the deceased. After all, if your clients want the best they can get from the deceased, then it would very much help if you were to provide as complete a list of what you can give to your clients as possible, for their own peace of mind if nothing else. Any invoice templates in Word you may use would allow you to record and charge for a variety of different products and services. In your case, you might see fit to let clients use your facilities in order to see the bodies of their loved ones. If so, then you should also take care to include the related fees for the use of your facilities. After all, you would be doing much of the maintenance, to say nothing of the fact that you would be hosting perhaps a great number of people depending on the number of people using the facilities. Funeral homes do also have the responsibility of transporting the remains to wherever they will be put to rest. 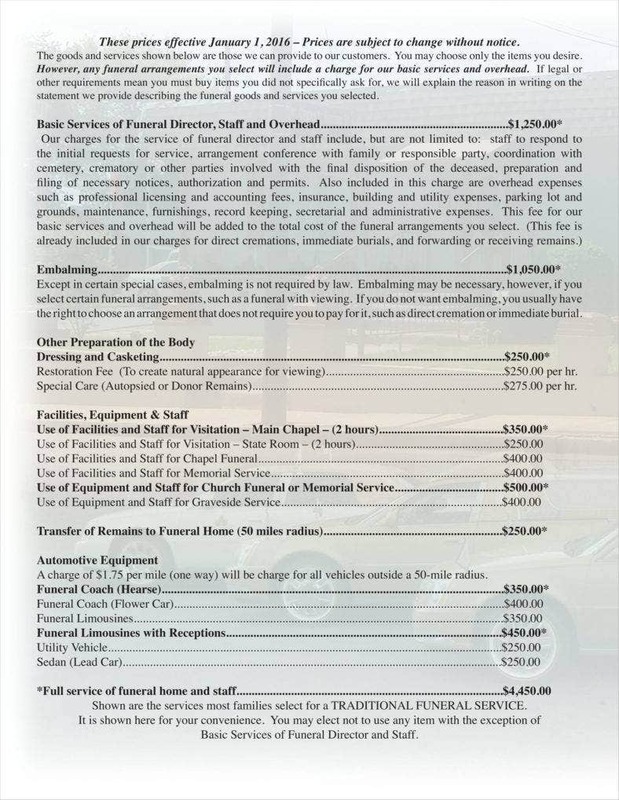 As such, you would also have to charge your clients for the cost of transporting the remains, the use of your hearse, the cost of fuel, and others. Since this is another service you are doing on behalf of your clients, then it is only right that you charge for the effort you put into it. This is especially true in your particular case as transportation of bodies is not something just anyone can do. Some funeral homes even offer transportation for the family of the deceased, so you may also see fit to offer such a service to them as an added convenience. Another aspect of the services offered by a given funeral home is offering a casket for the deceased, or an urn in the case of cremations. In your case, you may want to use sample inventory lists to provide your clients with a selection to choose from. 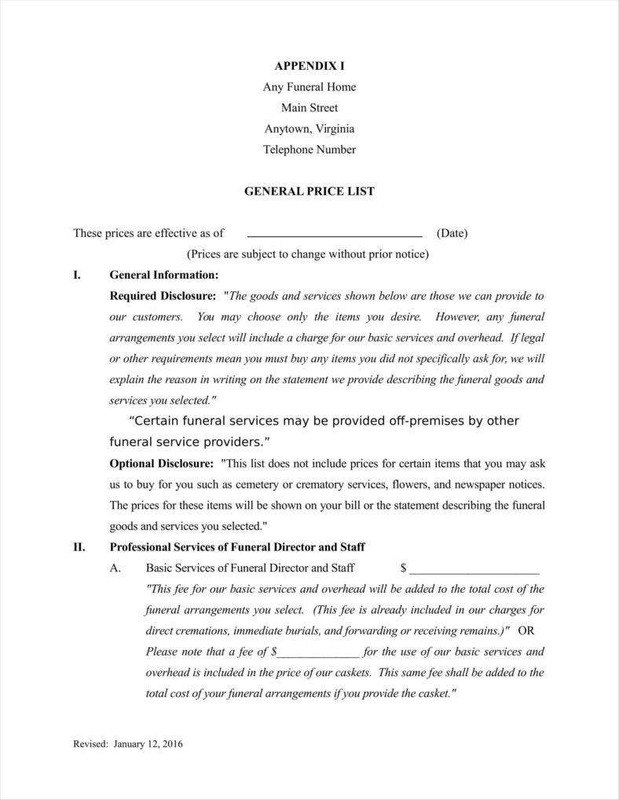 This is another element that definitely needs to be present as your general price lists do need to provide a complete list of all the services your funeral home can provide to your clients. As the coordinator for the funeral service proper, you may also have to handle the fine arrangements of the funeral. This includes working out the details of the funeral plot. 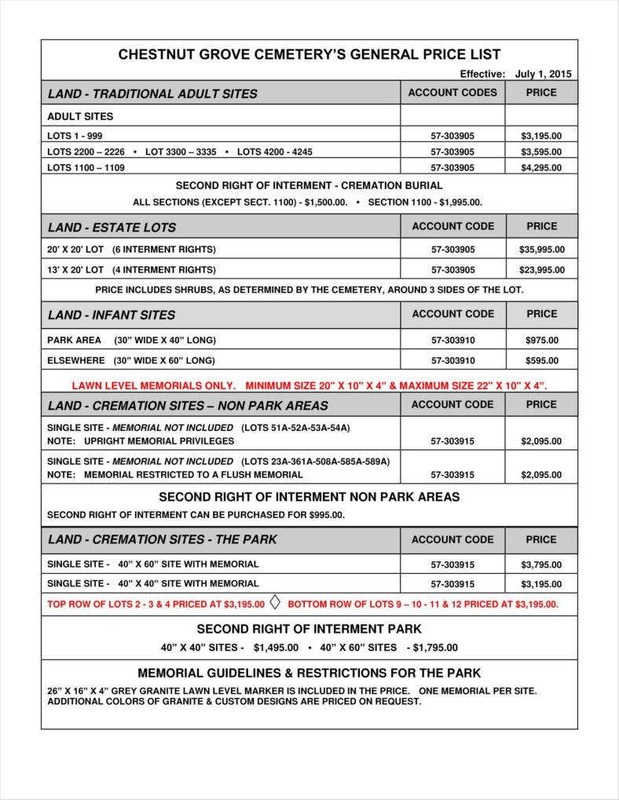 You can include very detailed choices for your clients so that they can find the best possible location for the deceased. Of course, you can even provide a variety of choices to suit the particular needs of given clients depending on the nature of the deceased they wish to have buried. 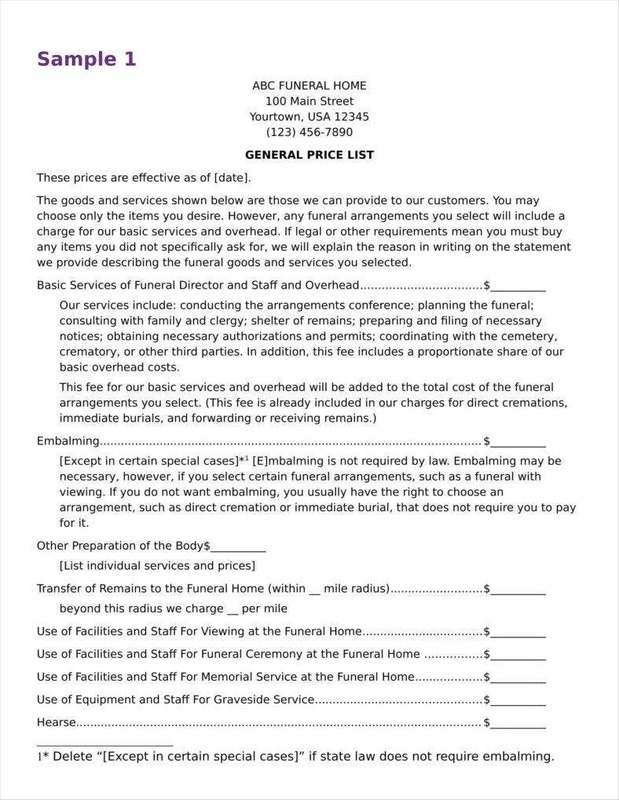 In the interest of expediency or thrift, some clients may want a more uncomplicated service for the deceased. 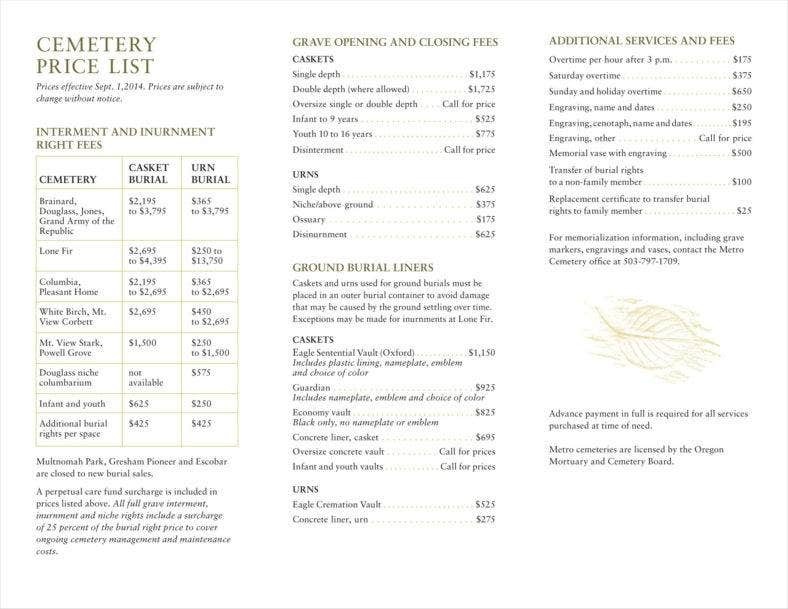 As such, you should include the option of direct burial and cremation in your own sample price list templates. This allows you to give your clients a quick burial for the deceased at the lowest possible cost, which could be an attractive option for the more economically-minded. When using any list templates you may find yourself, you would be wise to take advantage of certain tips that could go some way toward helping you make the most of those templates. After all, in order for you to make the most of any price lists you need to help market your business, it pays to make sure that they are as well-made as possible. Be sure to update regularly. Like any other service, it pays to make sure that you update the prices you include in your price list templates in Word. 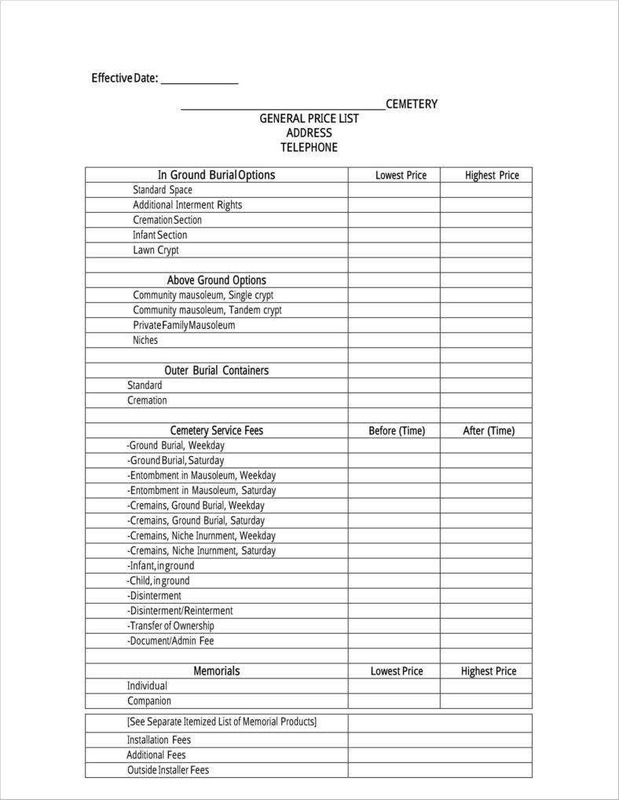 After all, prices always fluctuate, so it pays to have your own general price lists updated so that your potential clients can stay up to date concerning what prices you charge for the services you offer. Make sure to include your contact information and address. Whenever you manage to attract clients, it is always wise to have your contact information and address listed on your general price lists. After all, if clients are interested in taking advantage of your services, then they would want to get in touch with you to specify their needs. As such, it would only be good business sense to include such information on your price sheet templates. Be sure to include options for your clients. As with other tools like inventory list templates, it is wise to include options for your clients to choose from. This is also true of a funeral home as you would need to include different options to suit the intentions and means of your clients. Like any other service, it would pay for you to include this so that you can satisfy the needs of as great a body of customers as possible, and increase the population you might be able to serve. Make sure to include full disclosure in your list. This is an especially vital requirement of general price lists as you have to explain certain things on the list for the benefit of laymen. After all, your clients are very likely not to understand the inner workings of a funeral home in the same way you do. As such, you should take care to include full information for your clients to work with, which would allow you to better understand what you can do for them. Some of these disclosures may also be required by law, so it would be wise to include them just to keep yourself safe. Be sure to also have a full list on hand. It is generally prudent to keep yourself in mind when you use product list templates to make your general price lists. After all, your clients will probably have questions for you when they come to make arrangements with you. In such cases, it would pay to keep your own copy of the general price list so that you can work with your clients more easily and determine exactly what they need from you. With these insights, you should now have a better idea of how to make and use your own general price lists, which should make it much easier to conduct your business and give your clients some measure of closure.